Today's bridge was built somewhere else and later transported to its present location. As we shall see, there are a couple of these 'relocated' truss bridges in Sonoma County. I imagine someone had to disassemble the bridge, carefully label all the connections, load the pieces on a truck, and put the whole bridge back together again. Fortunately, the bridge is held together with pins (see photo below), which makes it easier to take it apart with a couple of wrenches (and maybe some cheater bars and WD-40). 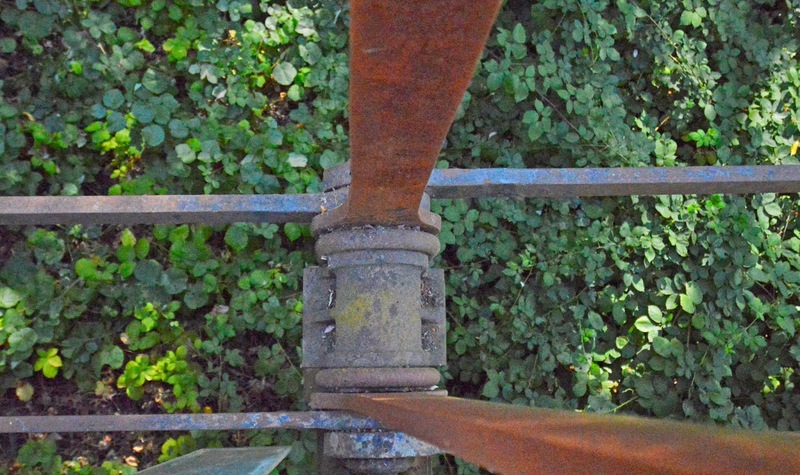 Hopefully the bridge wasn't so rusty when they were disassembling it. The Geysers Road Bridge (20C0005) crosses over Old Sulphur Creek and it's in a very remote location. Geyser Road runs along a canyon high above the creek and I had to drive on the deteriorating one lane dirt road to get to the bridge. I read on the Bridgehunter Website that they are planning to bypass the existing structure and build a more seismically resistant bridge across the creek. Considering that the existing bridge carries only about 100 vehicles a day a new bridge seems like an expensive proposition. Perhaps a developer is hoping to turn this remote area into a bustling community? This bridge has some nice details such as the cross-bracing on the corners of the portal frames and the thick, decorative compression members. In the photo above, the left member is encased in a sheath. Perhaps the original member was hit by a vehicle and now needs to be braced? Sonoma County, California Bridges: Geysers Road Bridge across Old Sulphur Creek by Mark Yashinsky is licensed under a Creative Commons Attribution-NonCommercial-NoDerivatives 4.0 International License.